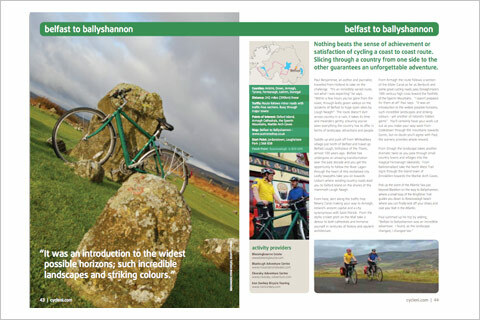 The first proper 'cycling guide' to Northern Ireland was published last year. I've always cycled. Even when it was deeply unfashionable. I couldn't drive until I was in my mid 20s. I never really found the need for a car in a city. Over the past 10 years I became a bit more active, trying to promote it as a viable means for getting about, organising Bike to Work events, Sportiffs etc. Cycling now seems to be fairly 'cool' again. One of my first forays into the web was belfastandbeyond, dating back almost 10 years! Essentially, it was in response to the complete lack of information provided by the Northern Ireland Tourist Board. Through various forums I was repeatedly asked about cycle holidays in Ireland, so I stuck this up on the web and kept it updated for about 3 years. The Tourist Board eventually came to their senses and handed over the promotion of cycling & bike related holidays to CAAN. They're dedicated and enthusiastic about what they do. I eventually took the site down as there wasn't really any need for it. 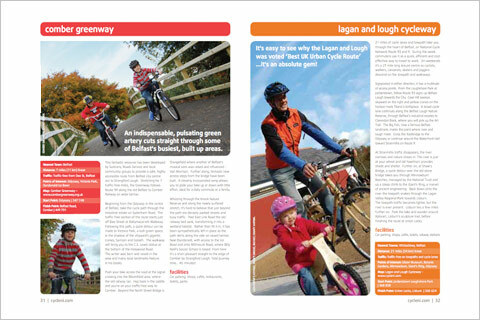 CAAN then asked me if I could provide the copy and some photography for their new cycle guide. I designed their Walking Guide in a previous life but to actually write the copy was something of a departure. I'm usually on the other end complaining about late copy and having to mock up pages in Ipsum until the copywriter gets a finger out. CAAN follow the Tourist Board's Brand . It's fairly loose and not prescriptive at all, which can be problem when trying to find the right 'voice'. However, a meeting with the ever helpful CAAN editor, and a few draft versions got me on the right track very quickly. I'd written a number of pieces for Cycling Plus so I was comfortable enough writing, but taking on 15,000 words and a 60 page brochure was something different. The brief was to write 40 small pieces of 300 words and 6 long distance routes of 600. Luckily I'd ridden most of the routes, or ridden in the general location but life on the other side was a bit different. I took a hot desk in offices close by as the space taken up by the maps and brochures began to swamp my small home office. Being able to pin lots of maps and brochures to a wall and leave them over night without children pulling them down was pretty handy. Google earth is a God send for this type of work and was invaluable on researching routes that had never been written about before. Steering away from the cliché (get it? ), is always a problem, it gets more problematic when writing about a very narrow subject, so it was important to focus on each route, give it some identity and highlight why it was worth making the effort. Limiting the 'breathtaking', 'unbelievable', 'stunning' and the long list of generic phrases associated with tourism pieces was a priority. I was conscious that cyclists would be reading it. They're a very diverse group so when a route was a leg busting climb then I tried to convey this up front rather than lead anyone up the garden path. Similar to graphic design, inevitably some of your best ideas, or what you perceive to be your best, end up on the cutting room floor. Some phrases and well crafted lines that I laboured over into the small hours either disappeared or were chopped off in their prime. Bloody editors! 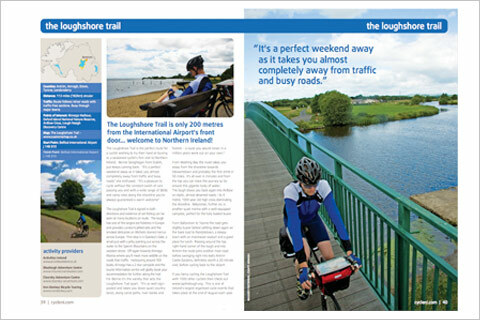 You can grab a copy of Pedal over at Cycle NI.